25 Days of Christmas Tags with Winnie & Walter! This is my second post for today. My Runway Inspired Challenge post is HERE! I am participating this year as design team member of Winnie & Walter. 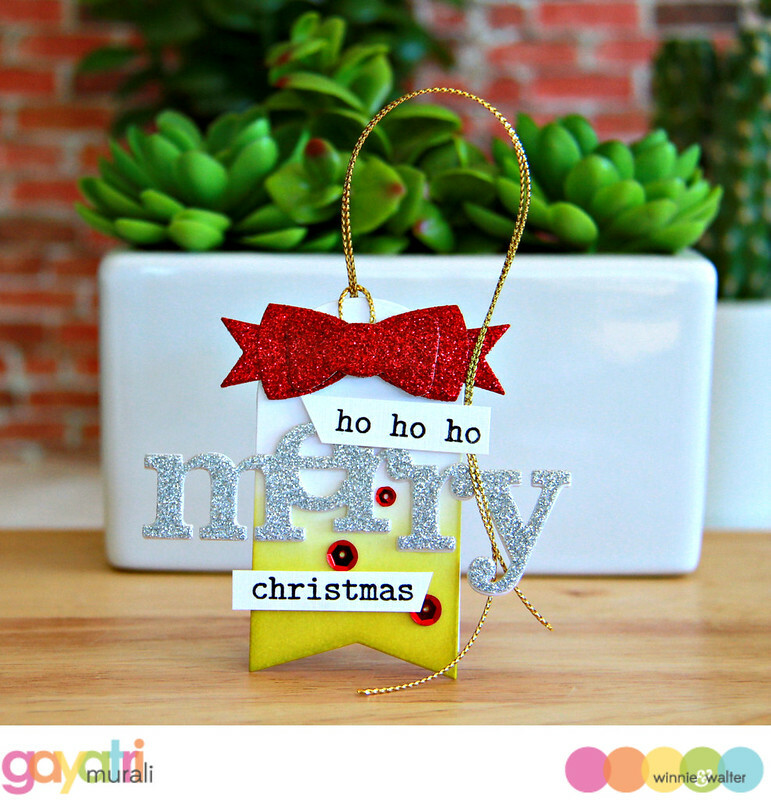 Here is my Christmas tag using Winnie & Walter’s new release products. The tag is from Essentials: Noelle Cutaway set. I die cut two of them and attached the second tag behind the first after scoring an inch from the top. The tag on the back will be to write a personal message. ON the tag front, I die cut four In a Word: Merry using white cardstock and one using silver glitter paper. I stacked and glued them with the silver glitter die cut on top of the stack. The bow is die cut using red glitter cardstock using Take a Bow Cutaway. The smaller sentiments are from The Big, the Bold and Merry stamp set. Before adhered the die cut and stamped elements on the tag, I sponged Crushed Olive distress ink towards the bottom of the tag. Then added some metallic red sequins from Pretty Pink Posh Classic Christmas sequins mix and gold twine to the tag. Hi Gayatri!!! Another stunning layered tag! You and Shay need to give me some tips! LOve the sparkly cardstock! I also prefer this Olive green to some of the Christmas greens! I just love how festive and sparkly your tags are! Beautiful! Love all that sparkle and shine! What a wonderful, sparkly tag! Oh Gayatri, this is really something! Great job! Love all the glitter Gayatri!! Very nice and festive!! Oh how pretty. love the sparkle!! LOVE your CHEERY colours, SPARKLE, layers and design, LOVE IT ALL!!! 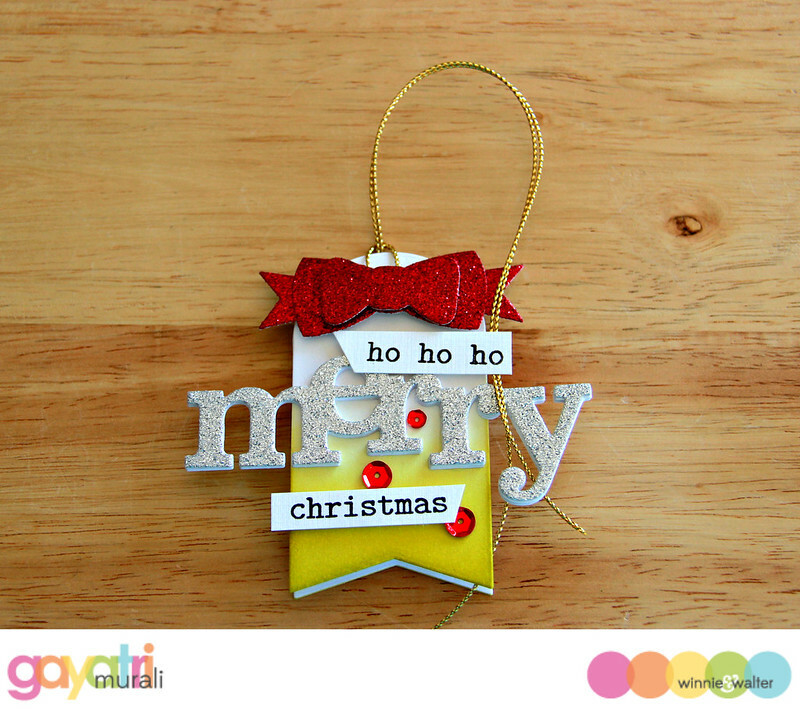 Love this gorgeous and festive tag with glittery look! I especially love the distressed bottom and pretty red colored sequins, really popped up the entire creation, love it! Beautiful tag. I admire your ability to choose the color! Gayatri I love everything about this tag, the bright colours and that fantasti red bow!! So thrilled that you joined me again this year!! beautiful! I love Winnie & Walter! I love the clean and modern look of this tag! In fact, I like it so much, I used it as inspiration… thanks!